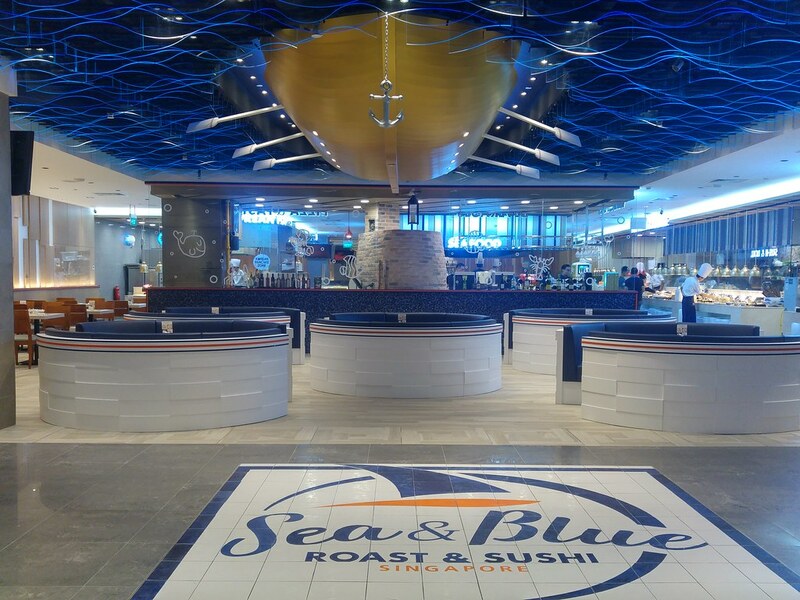 If you are a fan of Korean food, you would have probably already heard of Sea & Blue, a continental and korean buffet restaurant at The Shoppes at Marina Bay Sands. 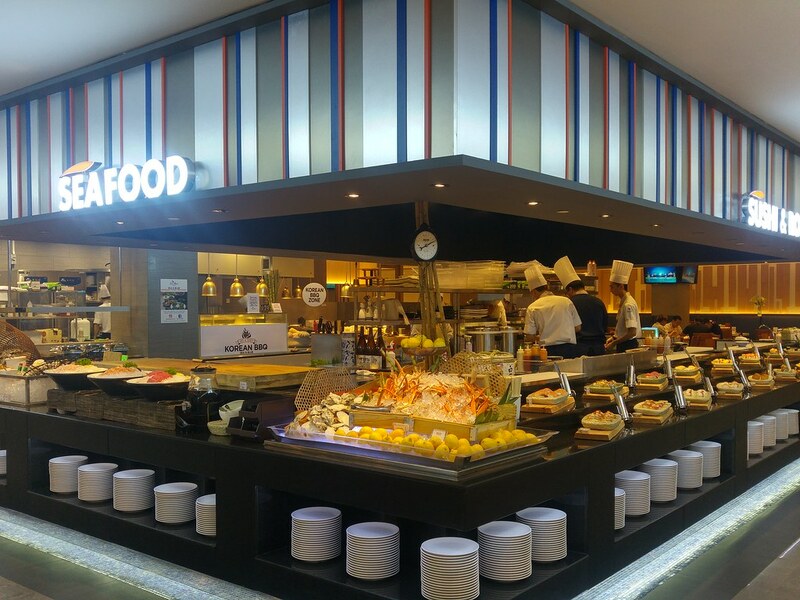 Other than an extensive curation of popular Korean dishes and desserts, there are over 100 food selections ranging from fresh seafood, roasts, western highlights, Japanese fare to our local favourites. I head straight to the Korean section. I was delighted to see assorted Pajeon (pancake) freshly pan fried on the spot. It's so difficult to get individual portion when dining at Korean restaurants. 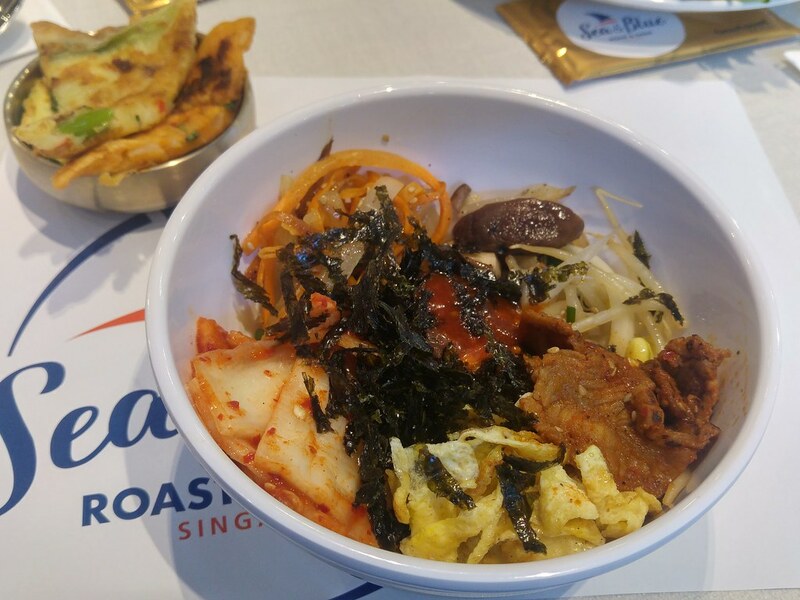 I got to satisfy my cravings for Japchae and Kimchi Fried Rice too! I had fun building my own Bimbimbap bowl with the array of toppings available such as beansprouts, seaweed, omelette and topped it up with spicy bulgogi available at the side as one of the Korean staples. If you would like yours to be more professionally done, simply ask the Korean chef stationed within to help you with it. Other DIY items includes Guksu (hot noodles). This is where the fun begins especially if you are dining with a big group of friends and families. Within the Korean section, you will find the must-have Korean barbecue. Indulge in its top-grade Pork Belly or Short Ribs in either a spicy gojuchang (red chilli paste) marinade or unseasoned. 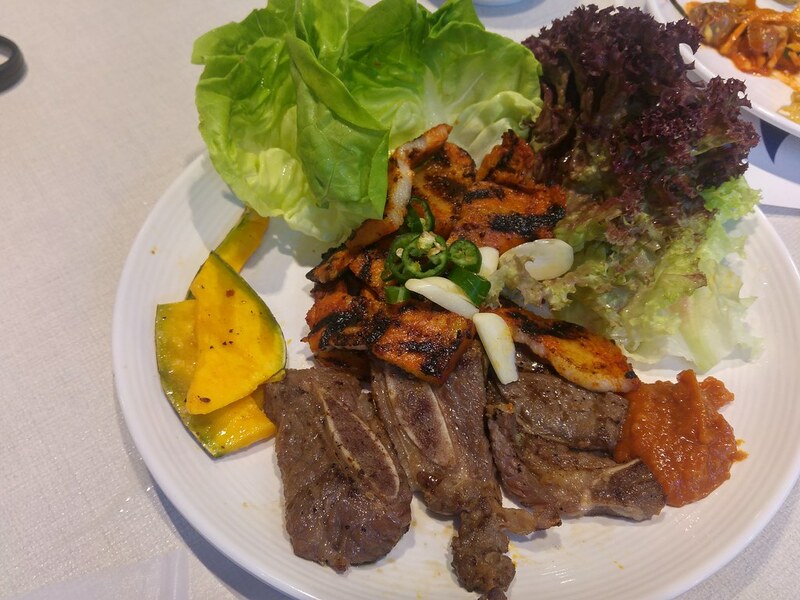 The way to enjoy the sizzling meats in a Korean manner is to cradle the meat with crisp fresh lettuce, wrap it with some cucumber sticks and some other crunchy vegetables before stuffing in the goodness. You can get all that fresh greens just right opposite at the salads & fruits section. 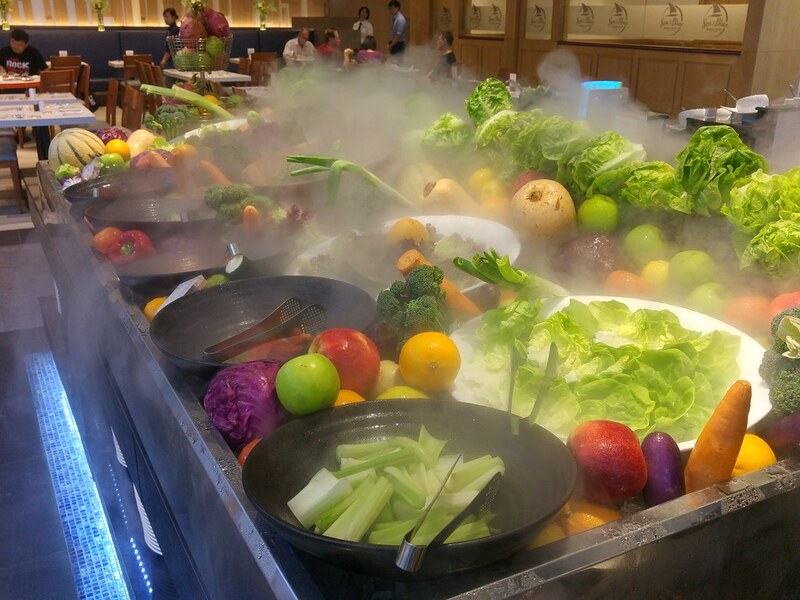 I have never seen a salad counter that looks so pristine, yet exuberant and inviting, almost like a walk-in chiller with the cold air rising. Around the counter is the fruits section, where I got a Watermelon cooler topped with fruits to go with my BBQ meat. Being an underwater themed restaurant, it does deliver good quality seafood. 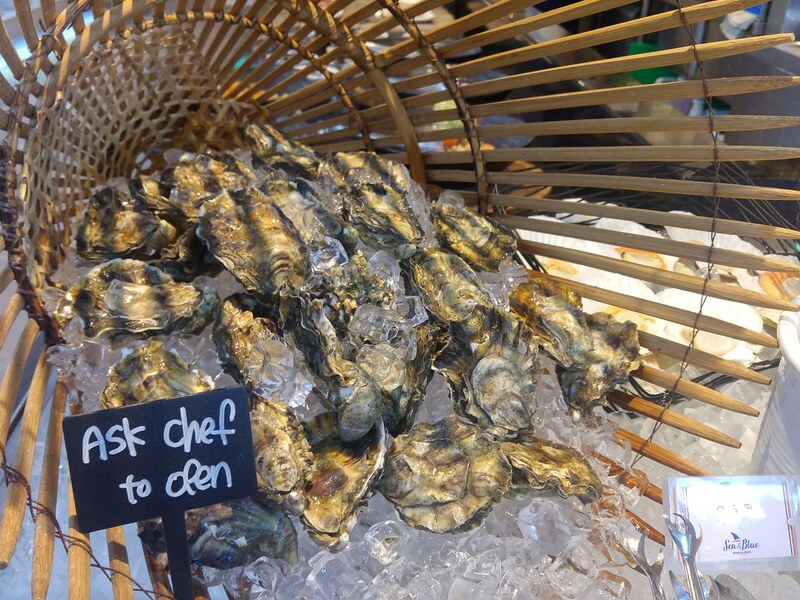 You get to choose and have your Canadian Oysters shucked on the spot. 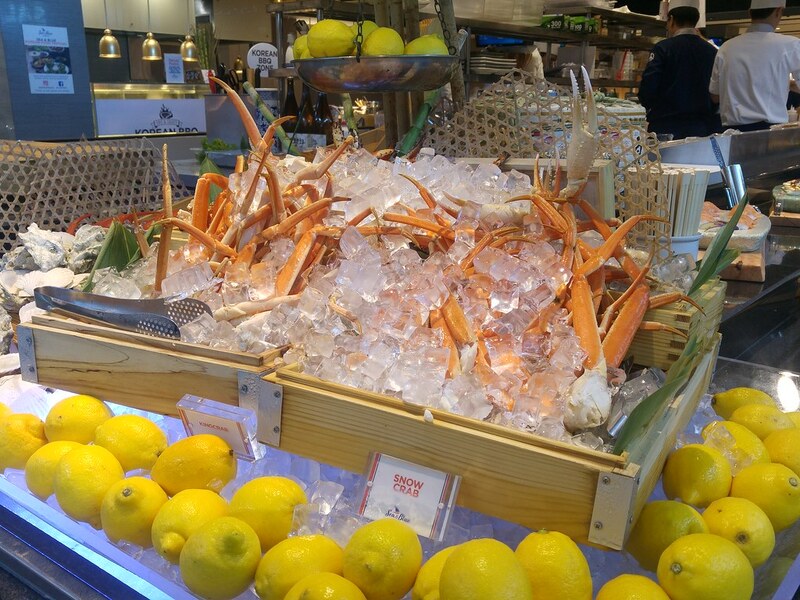 Also available are the Cold Prawns, chilled Scallops on the half shell and Snowcrab Legs on ice. My favourite is still the sashimi which I had along with really delicious salmon aburi rolls and unagi roll as well as Gimbap (Korean rice rolls). The sushi here are notable, unlike those boring and stale maki sitting at some other buffet counters. The chef creates bites size sushi that allow you to enjoy more. Apart from sushi, roasts are the stars here as well. 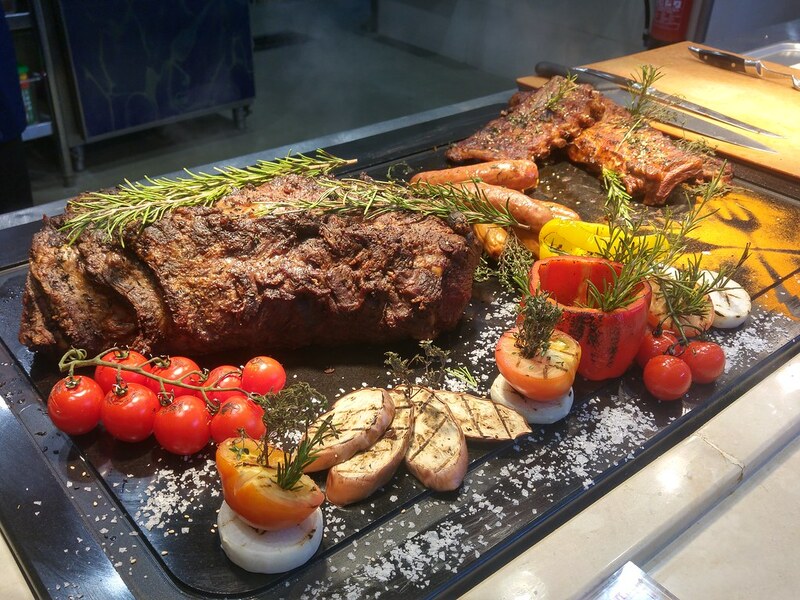 On the carving board, the slab of Oven Roasted Ribeye Striploin is the mainstayer, with one other daily special. Further to its right, another trying to grab my attention the Suckling Pig. What took me by surprise is the grilled Salmon - the skin was evenly crisp all over and the meat was pink, extremely moist and tender. It is easily one of the best I ever had. I like the Kurobuta Pork as well, which even comes with charred pineapples. 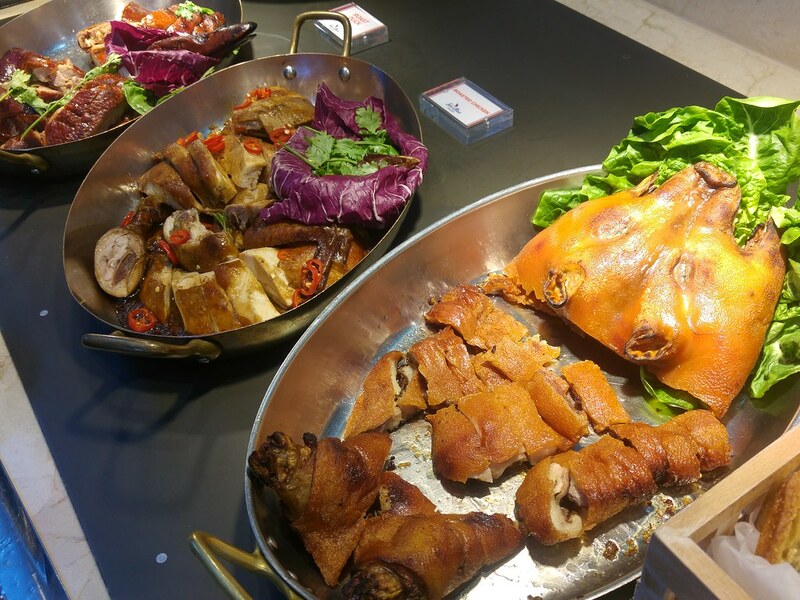 There are also local dishes such as chilli crabs, salted egg prawns and roast duck. Similar to most buffets, petite cakes and pralines are available. 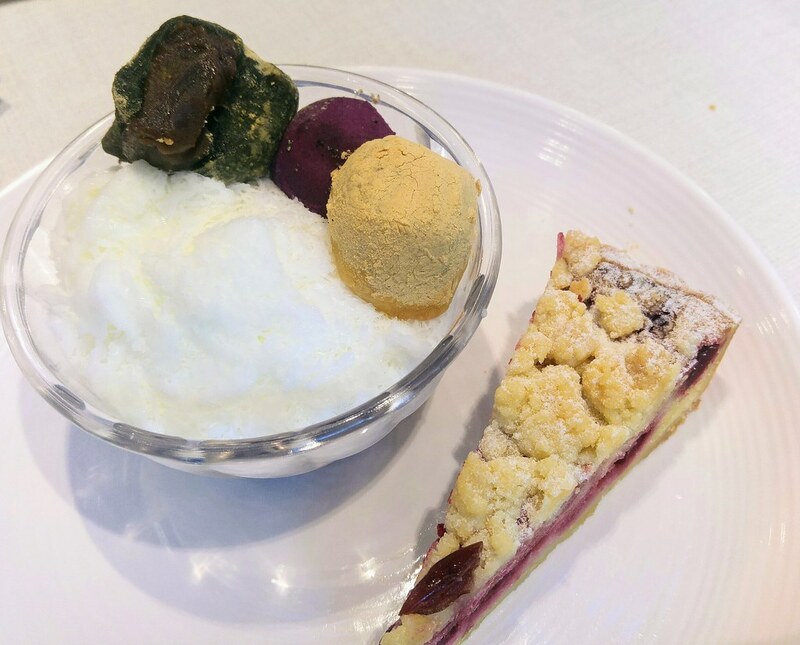 What I find more enticing are the Tarts, Bingsoo, Gyeongdan (Korean rice cake) filled with red bean paste and Yakbab (Korean glutinous rice balls with honey and dried fruits). The Bingsoo is really light and fluffy, just right after a heavy meal. I kind of miss the Sour Cherry Tart and regret not trying its Apple Tart. Milk. Soft-Serve is also available if you ain't a pastry person. Sea & Blue has much room to move around which makes buffet dining here quite enjoyable. It can seat up to 350 pax with several private rooms and a function room complete with AV equipment for bigger events. Prices at Sea & Blue are between $42++ to $64++ for adults during lunch, and $58++ to $68++ for dinner. Children dine at $22++ to $26++ at lunch and $26++ at dinner.